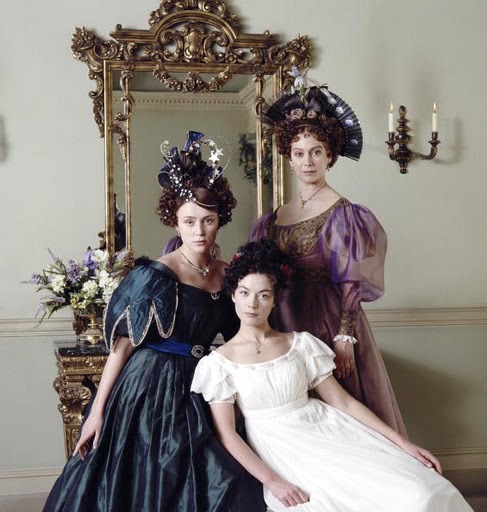 Every time we have posted something related to Wives & Daughters on this here blog or over on Facebook/Twitter, many of you get excited… and it’s no wonder, because while knowledge of this BBC miniseries has faded, it’s a classic and it needs to be resurfaced. 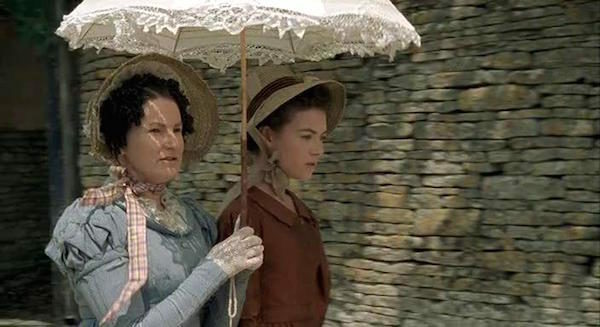 The 1999 adaptation of the Elizabeth Gaskell (who also wrote North & South) novel is nearly perfect: interesting characters, a story that takes its time and doesn’t always go where you think it will, and faaaaaabulous 1830s costumes. Now we’ve got a whole WEEK of celebration of Wives & Daughters, so join us for the ride as we look at all the hot boys, why this series rocks, and then the wardrobes of our main characters! Yesterday we talked about all the Man Candy in Wives & Daughters. 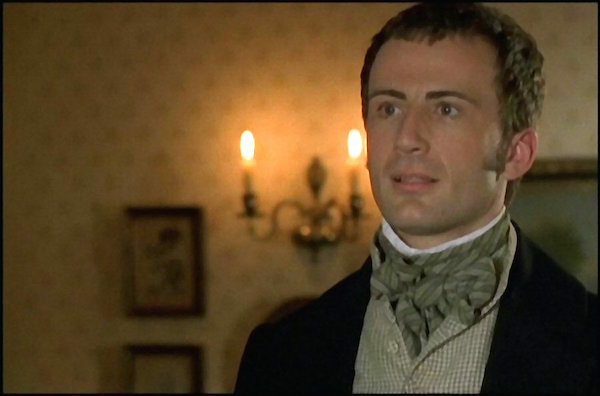 Now, for those of you who don’t know what the hell I’m talking about, and for the longtime fans, let’s detail why this 1830s-set Elizabeth Gaskell adaptation is so fabulous. 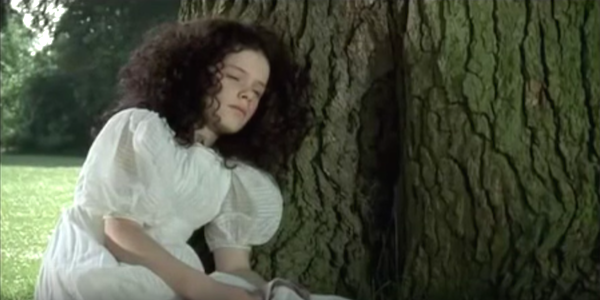 Justine Waddell (Mansfield Park, Great Expectations, Tess of the D’Urbervilles) plays Molly: the sweet, young, innocent daughter of a doctor living in a small village in England. Her mother died when she was young, so it’s just her and daddy dearest, and Molly loves it that way. But life gets a whole lot more complicated, and Molly has to do a lot of growing up. She stays sweet, but she learns to find her own backbone and what’s important in life. Molly starts out young, kind, and innocent. 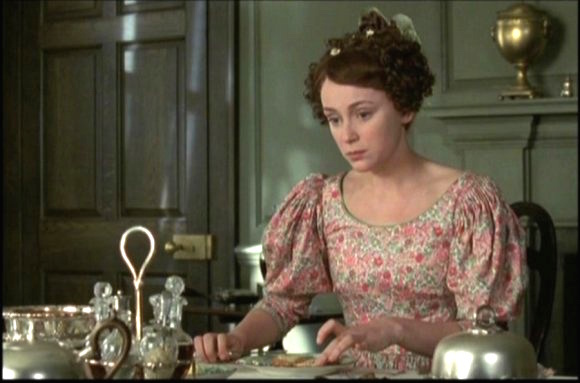 A big spur to Molly’s growth comes with the introduction of the other main character, Cynthia, played by Keeley Hawes (The Durrells in Corfu, Upstairs Downstairs, Tipping the Velvet). Molly’s dad remarries and while that doesn’t necessarily work out in Molly’s favor, the upside is that she gains a step-sister. Cynthia is many things Molly is not: glamorous, feisty, and fun. She brings a lot of sparkle to Molly’s life … and some complications. But Cynthia isn’t as straightforward as she seems, and she has her own issues to work out and her own growth to accomplish. Cynthia and Molly, BFFs forever! 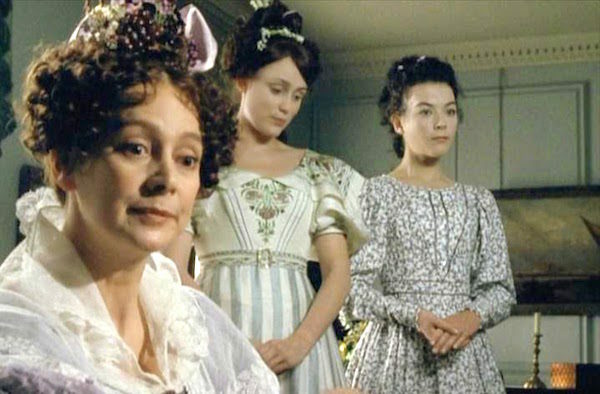 Oh, Hyacinth (Francesca Annis of Cranford, Jane Eyre, and Lillie). She means well, in her own limited fashion, but oh does she complicate Molly’s (and Cynthia’s) life with her shallowness and self-centeredness. Hyacinth was widowed when Cynthia was young, and she spent most of her life as a governess to a wealthy family. When she charms Molly’s father, he marries her, and she finally gets her own life and her own household. She revels in finally being her own mistress, but her attempts to be a mother to Molly and Cynthia cause some real complications to her daughters’ lives. And super kind, sweet, handsome, and smart Roger! 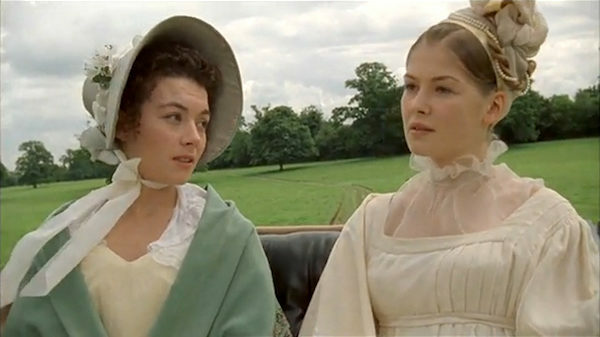 Lady Harriet (Rosamund Pike: Women in Love, Pride & Prejudice & Pigs, The Libertine, Love in a Cold Climate), the glamorous daughter of the local aristocratic family. She’s sophisticated, smart, and she brings some much-needed sense and bite when appropriate. 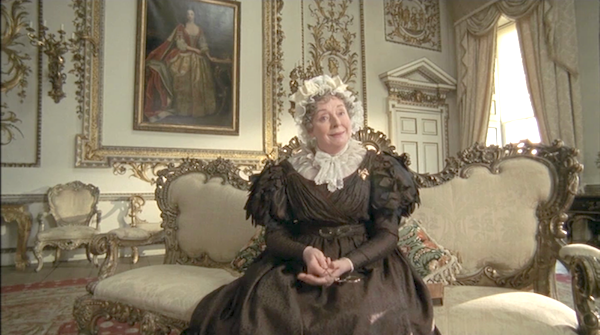 Lady Cumnor, Harriet’s mother and played by none other than Barbara Leigh-Hunt, or as you and I know her, Lady Catherine de Bourgh from the 1995 Pride and Prejudice. 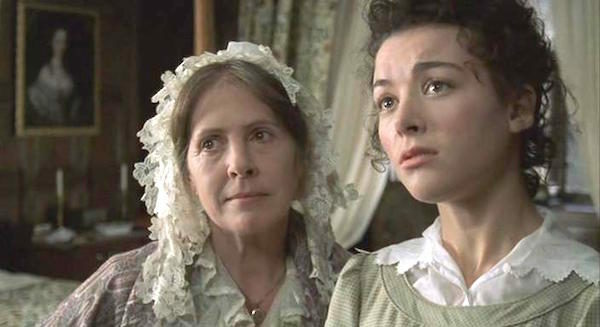 Miss Phoebe (pictured) and her sister Miss Browning, two local spinsters who alternately mother and interfere in Molly’s life. Bear with, these whole young-Molly scenes set up an important dynamic. Step-mother Hyacinth isn’t horrible, but she isn’t perfect either! Roger and Molly, perfect for each other! Except Roger? He’s into Cynthia, and she’s into him! Heartbreak for Molly! Cynthia’s glamour overshines Molly’s sweetness. And the plot continues to thicken — and other sub-plots emerge — over four episodes full of twists and turns! 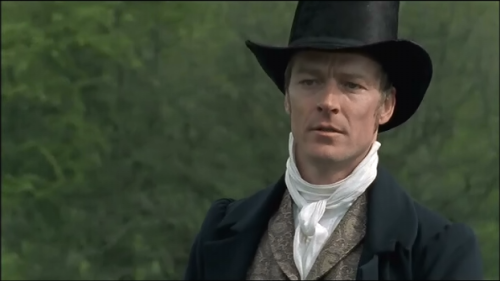 On top of everything, you’ve got costumes that are 1. historically accurate, 2. of a period (1830s) not seen very often, and 3. just plain gorgeous. Designed by Deirdre Clancy, you get to see a wide range of beautifully done day- and evening-wear that spans the class spectrum from genteel poverty to the pretty-darn-rich. Sweetly pretty dresses for everyday, with Hyacinth always dressed to the nines! Holy crap! 1830s-appropriate corsetry with bust gores and busks perfectly capturing the transition between Regency and Victorian! Hyacinth (left) with pearl drops in her hair and sheer organza oversleeves! Lady Harriet (right) rocking the complex hair arrangement! Cynthia in a beautiful changeable taffeta ballgown with fabulous sleeves, Molly in a sweet white embroidered dress, and Hyacinth in a goooooorgeous changeable lavender organza gown. AND CYNTHIA AND HYACINTH’S HAIR!!! 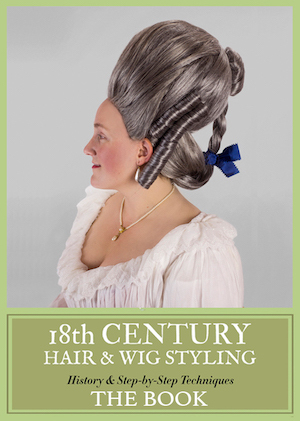 If you’ve always thought “huh?” or “ew” about the 1830s, prepare to rethink! Stay tuned for a whole lot more about costumes in our next three posts, as we look specifically at the wardrobes of Molly, Cynthia, and then Hyacinth and Lady Harriet! What’s your favorite thing about Wives and Daughters? Is it the female characters? The boys? The plot? The costumes? 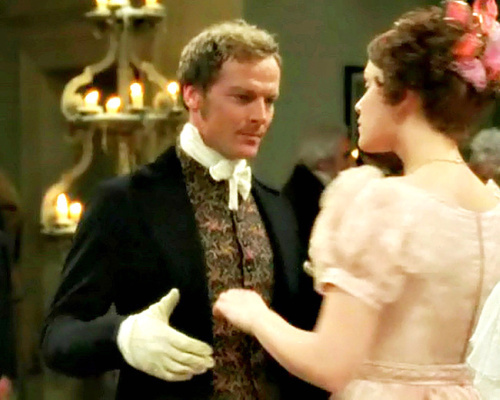 I absolutely love this movie, it is the closet thing to a Jane Austen story that’s not a rewrite or a prequel or sequel (and the book is equally wonderful — the adaptation is extremely faithful, but the book is even better. It’s 500 pages long and it just flies by). I love everything about this — the relationship between Cynthia and Molly, the love triangle (quadrangle? ), Molly and her dad, the Squire — it is indeed practically perfect. I normally want to strangle Hyacinth but she’s not intrinsically bad, just self-centered. Besides, she had a tough time of it before she finally married Dr.Gibson. And I love that Bill Paterson shows up again in Outlander! Yes the book is wonderful too! The women’s clothes are TDF. It gives me clothes/costume lust. I’m not sure of the year, when the grown up Molly appears, but everything feels like 1835 or thereabouts. I do know when Cynthia goes to London there’s a reference the young queen (Victoria) so that part is 1837. This and P&P with Colin (sigh) are my all-time favourites. 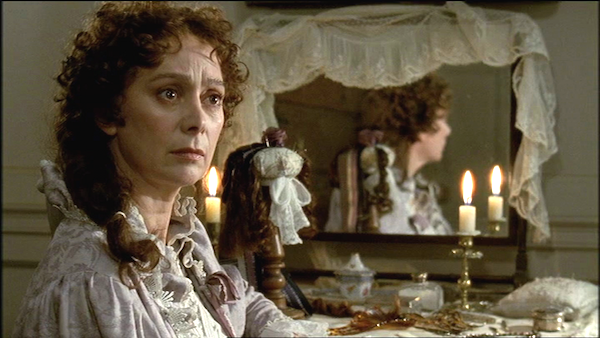 But can anyone explain Lady Harriet’s short hair near the end? 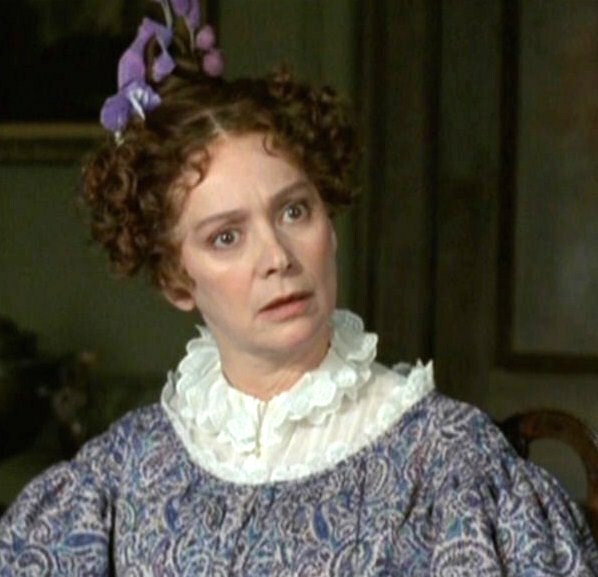 Yes, please somebody tell us what is going on with Lady Harriet’s hair! I have also wondered about this. I was always under the impression it was due to recovering from a fever. And this is one of my all time fav adaptations! 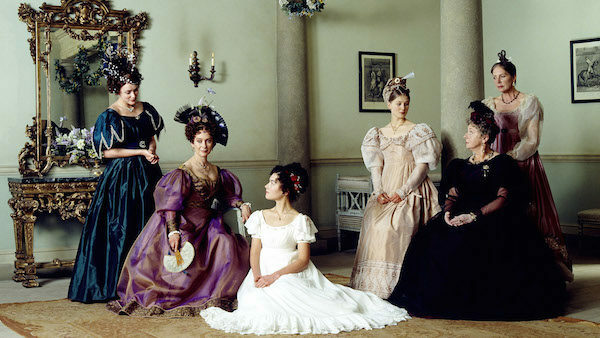 The women portrayed as being complete human beings within the confines of proper decorum – such a rare treat! But Cynthia’s life is far more complicated than is initially obvious, most especially her connection with the sinister-but-hot Mr. Preston. Why is Mr. Preston sinister? I never bought him as a villain. Frankly, he proved to be a chump, poor man. I think many fans disliked him, because Molly did. And Molly disliked him because the Hamleys and Cynthia did. The Hamleys disliked him because he wasn’t properly “deferential” to the squire (cough! class issues!). And Cynthia disliked him because she had used him and did not want to face the consequences of her actions. I think Mr. Preston got a bad rap. Yes, what Susan said below. Mr Preston tried to pressure Cynthia into a relationship with him even though she was clearly uncomfortable and said so. You’re made very good points, but I seem to remember that Mr Preston tried to ‘marry up’ once before – both Lady Harriet and Lady Cumnor mention it, I believe. But Cynthia changed her mind. She saved money to pay Mr Preston back. He refused to accept it. That makes him a villainous hunk. Eeeeeee! I’m Kermit-flailing over this week’s posts! It’s all just so joyous and fun! W&D really has everything – great nuanced characters, wonderfully complicated – but not overly so – plot, and the adaptation has Ah-mazing costumes! This series alone started to turn my head towards the 1830s. I haven’t gone down that rabbit hole with my own sewing yet (I got waylaid by Natural Form, lol) but it’s sure to come! Although I find a lot in the characters and plot actually frustrating, it’s simultaneously all so lovable. I find it so hard to choose a favourite character, but it may actually be Francesca Annis’ Hyacinth, she just totally cracks me up. I think Cynthia may be a close second. Although this may also be influenced by their topnotch clothing and HAIR game – oh, their hair! My favourite TV series and I have been too busy all week to comment. Firstly thank you for blogging on this, It is nice to know that I am not along in loving this series. 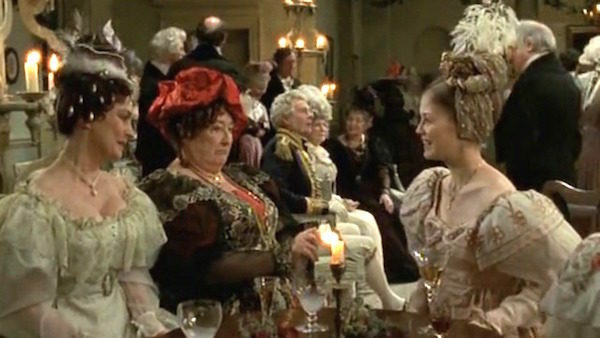 Everything about W&D was excellent, script, acting, costumes, but what never fails to impress me on my numerous re watches is the attention to detail, Mr Gibson eying of the cheese when he is dining with the Squire, Cynthia and Hyacinth always sewing, (as described in the book) and all the subtle nuances of character which are captured so well. The ending also really works. There was a Victorian couple who explored Africa together. I love the concept of Molly escaping the cloying domesticity of mid century England. The couple was Sir Richard Burton and his wife, subject of Mountains of the Moon. Sir Richard was a noted Arabic scholar, traveller and translator of Omar Khayyam.